Not to be confused with Titan, Tintin, or Titian. Titin /ˈtaɪtɪn/, also known as connectin, is a protein that, in humans, is encoded by the TTN gene. Titin is a giant protein, greater than 1 µm in length, that functions as a molecular spring which is responsible for the passive elasticity of muscle. It is composed of 244 individually folded protein domains connected by unstructured peptide sequences. These domains unfold when the protein is stretched and refold when the tension is removed. Titin is important in the contraction of striated muscle tissues. It connects the Z line to the M line in the sarcomere. The protein contributes to force transmission at the Z line and resting tension in the I band region. It limits the range of motion of the sarcomere in tension, thus contributing to the passive stiffness of muscle. Variations in the sequence of titin between different types of muscle (e.g., cardiac or skeletal) have been correlated with differences in the mechanical properties of these muscles. Titin is the third most abundant protein in muscle (after myosin and actin), and an adult human contains approximately 0.5 kg of titin. With its length of ~27,000 to ~33,000 amino acids (depending on the splice isoform), titin is the largest known protein. Furthermore, the gene for titin contains the largest number of exons (363) discovered in any single gene, as well as the longest single exon (17,106 bp). Reiji Natori in 1954 was the first to propose an elastic structure in muscle fiber to account for the return to the resting state when muscles are stretched and then released. In 1977, Koscak Maruyama and coworkers isolated an elastic protein from muscle fiber which they called connectin. Two years later, Kuan Wang and coworkers identified a doublet band on electrophoresis gel corresponding to a high molecular weight elastic protein which they named titin. Labeit in 1990 isolated a partial cDNA clone of titin. In 1995, Labeit and Kolmerer determined the cDNA sequence of human cardiac titin. Bang and colleagues in 2001 determined the complete sequence of the human titin gene. The human gene encoding for titin is located on the long arm of chromosome 2 and contains 363 exons, which together code for 38,138 residues (4200 kDa). Within the gene are found a large number of PEVK exons 84 to 99 nucleotides in length which code for conserved 28- to 33-residue motifs which may represent structural units of the titin PEVK spring. The number of PEVK motifs in the titin gene appears to have increased during evolution, apparently modifying the genomic region responsible for titin’s spring properties. Titin is the largest known protein; its human variant consists of 34,350 amino acids, with the molecular weight of the mature "canonical" isoform of the protein being approximately 3,816,188.13 Da. Its mouse homologue is even larger, comprising 35,213 amino acids with a MW of 3,906,487.6 Da. It has a theoretical isoelectric point of 6.01. The protein's empirical chemical formula is C169,723H270,464N45,688O52,243S912. It has a theoretical instability index (II) of 42.41, classifying the protein as unstable. The protein's in vivo half-life, the time it takes for half of the amount of protein in a cell to break down after its synthesis in the cell, is predicted to be approximately 30 hours (in mammalian reticulocytes). N-terminal I-band: acts as the elastic part of the molecule and is composed mainly of type II modules. More specifically the I-band contains two regions of tandem type II immunoglobulin domains on either side of a PEVK region that is rich in proline, glutamate, valine and lysine. PVK elasticity has both entropic and enthalpic origins characterizable by a polymer persistence length and a stretch modulus. At low to moderate extensions PEVK elasticity can be modeled with a standard wormlike chain (WLC) model of entropic elasticity. At high extensions PEVK stretching can be modeled with a modified WLC model that incorporates enthalpic elasticity. The difference between low-and high- stretch elasticity is due to electrostatic stiffening and hydrophobic effects. C-terminal A-band: is thought to act as a protein-ruler and possesses kinase activity. The A-band is composed of alternating type I and II modules with super-repeat segments. These have been shown to align to the 43 nm axial repeats of myosin thick filaments with immunoglobulin domains correlating to myosin crowns. Titin is a large abundant protein of striated muscle. Titin's primary functions are to stabilize the thick filament, center it between the thin filaments, prevent overstretching of the sarcomere, and to recoil the sarcomere like a spring after it is stretched. 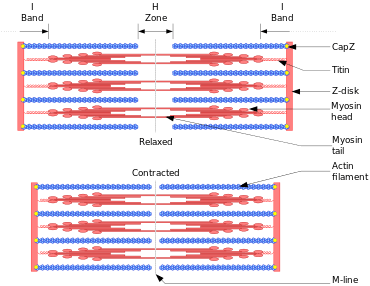 An N-terminal Z-disc region and a C-terminal M-line region bind to the Z-line and M-line of the sarcomere, respectively, so that a single titin molecule spans half the length of a sarcomere. Titin also contains binding sites for muscle-associated proteins so it serves as an adhesion template for the assembly of contractile machinery in muscle cells. It has also been identified as a structural protein for chromosomes. Considerable variability exists in the I-band, the M-line and the Z-disc regions of titin. Variability in the I-band region contributes to the differences in elasticity of different titin isoforms and, therefore, to the differences in elasticity of different muscle types. Of the many titin variants identified, five are described with complete transcript information available. Mutations anywhere within the unusually long sequence of this gene can cause premature stop codons or other defects. Titin mutations are associated with hereditary myopathy with early respiratory failure, early-onset myopathy with fatal cardiomyopathy, core myopathy with heart disease, centronuclear myopathy, Limb-girdle muscular dystrophy type 2J, familial dilated cardiomyopathy 9, hypertrophic cardiomyopathy and tibial muscular dystrophy. Further research also suggests that no genetically linked form of any dystrophy or myopathy can be safely excluded from being caused by a mutation on the TTN gene. Truncating mutations in dilated cardiomyopathy patients are most commonly found in the A region; although truncations in the upstream I region might be expected to prevent translation of the A region entirely, alternative splicing creates some transcripts that do not encounter the premature stop codon, ameliorating its effect. Autoantibodies to titin are produced in patients with the autoimmune disease scleroderma. The name titin is derived from the Greek Titan (a giant deity, anything of great size). As the largest known protein, titin also has the longest IUPAC name of a protein. The full chemical name of the human canonical form of titin, which starts methionyl... and ends ...isoleucine, contains 189,819 letters and is sometimes stated to be the longest word in the English language, or any language. However, lexicographers regard generic names of chemical compounds as verbal formulae rather than English words. 1 2 3 "Entrez Gene: TTN titin". 1 2 3 Labeit S, Barlow DP, Gautel M, Gibson T, Holt J, Hsieh CL, Francke U, Leonard K, Wardale J, Whiting A (May 1990). "A regular pattern of two types of 100-residue motif in the sequence of titin". Nature. 345 (6272): 273–6. doi:10.1038/345273a0. PMID 2129545. ↑ Eric H. Lee. "The Chain-like Elasticity of Titin". Theoretical and Computational Biophysics Group, University of Illinois. Retrieved 25 September 2014. 1 2 3 Labeit S, Kolmerer B (October 1995). "Titins: giant proteins in charge of muscle ultrastructure and elasticity". Science. 270 (5234): 293–6. doi:10.1126/science.270.5234.293. PMID 7569978. ↑ Minajeva A, Kulke M, Fernandez JM, Linke WA (March 2001). "Unfolding of titin domains explains the viscoelastic behavior of skeletal myofibrils". Biophysical Journal. 80 (3): 1442–51. doi:10.1016/S0006-3495(01)76116-4. PMC 1301335 . PMID 11222304. 1 2 Itoh-Satoh M, Hayashi T, Nishi H, Koga Y, Arimura T, Koyanagi T, Takahashi M, Hohda S, Ueda K, Nouchi T, Hiroe M, Marumo F, Imaizumi T, Yasunami M, Kimura A (February 2002). "Titin mutations as the molecular basis for dilated cardiomyopathy". Biochemical and Biophysical Research Communications. 291 (2): 385–93. doi:10.1006/bbrc.2002.6448. PMID 11846417. ↑ Labeit S, Kolmerer B, Linke WA (February 1997). "The giant protein titin. Emerging roles in physiology and pathophysiology". Circulation Research. 80 (2): 290–4. doi:10.1161/01.RES.80.2.290. PMID 9012751. ↑ Opitz CA, Kulke M, Leake MC, Neagoe C, Hinssen H, Hajjar RJ, Linke WA (October 2003). "Damped elastic recoil of the titin spring in myofibrils of human myocardium". Proceedings of the National Academy of Sciences of the United States of America. 100 (22): 12688–93. doi:10.1073/pnas.2133733100. PMC 240679 . PMID 14563922. 1 2 3 Bang ML, Centner T, Fornoff F, Geach AJ, Gotthardt M, McNabb M, Witt CC, Labeit D, Gregorio CC, Granzier H, Labeit S (November 2001). "The complete gene sequence of titin, expression of an unusual approximately 700-kDa titin isoform, and its interaction with obscurin identify a novel Z-line to I-band linking system". Circulation Research. 89 (11): 1065–72. doi:10.1161/hh2301.100981. PMID 11717165. ↑ Natori R (1954). "Skinned Fibres of Skeletal Muscle and the Mechanism of Muscle Contraction－A Chronological Account of the Author's Investigations into Muscle Physiology" (PDF). Jikeikai Medical Journal. 54 (1). ↑ Maruyama K, Matsubara S, Natori R, Nonomura Y, Kimura S (August 1977). "Connectin, an elastic protein of muscle. Characterization and Function". Journal of Biochemistry. 82 (2): 317–37. PMID 914784. 1 2 Wang K, McClure J, Tu A (August 1979). "Titin: major myofibrillar components of striated muscle". Proceedings of the National Academy of Sciences of the United States of America. 76 (8): 3698–702. doi:10.1073/pnas.76.8.3698. PMC 383900 . PMID 291034. ↑ Maruyama K (May 1994). "Connectin, an elastic protein of striated muscle". Biophysical Chemistry. 50 (1-2): 73–85. doi:10.1016/0301-4622(94)85021-6. PMID 8011942. ↑ Bang ML, Centner T, Fornoff F, Geach AJ, Gotthardt M, McNabb M, Witt CC, Labeit D, Gregorio CC, Granzier H, Labeit S (November 2001). "The complete gene sequence of titin, expression of an unusual approximately 700-kDa titin isoform, and its interaction with obscurin identify a novel Z-line to I-band linking system". Circulation Research. 89 (11): 1065–72. doi:10.1161/hh2301.100981. PMID 11717165. ↑ Freiburg A, Trombitas K, Hell W, Cazorla O, Fougerousse F, Centner T, Kolmerer B, Witt C, Beckmann JS, Gregorio CC, Granzier H, Labeit S (June 2000). "Series of exon-skipping events in the elastic spring region of titin as the structural basis for myofibrillar elastic diversity". Circulation Research. 86 (11): 1114–21. PMID 10850961. 1 2 "Titin - Homo sapiens (Human)". Universal Protein Resource. UniProt Consortium. 2010-10-05. Retrieved 2010-10-15. 1 2 3 4 "ProtParam for human titin". ExPASy Proteomics Server. Swiss Institute of Bioinformatics. Retrieved 2011-07-25. ↑ "ProtParam for mouse titin". ExPASy Proteomics Server. Swiss Institute of Bioinformatics. Retrieved 2010-05-06. 1 2 Wang K, McCarter R, Wright J, Beverly J, Ramirez-Mitchell R (August 1991). "Regulation of skeletal muscle stiffness and elasticity by titin isoforms: a test of the segmental extension model of resting tension". Proceedings of the National Academy of Sciences of the United States of America. 88 (16): 7101–5. doi:10.1073/pnas.88.16.7101. PMC 52241 . PMID 1714586. ↑ Linke WA, Ivemeyer M, Mundel P, Stockmeier MR, Kolmerer B (July 1998). "Nature of PEVK-titin elasticity in skeletal muscle". Proceedings of the National Academy of Sciences of the United States of America. 95 (14): 8052–7. PMID 9653138. ↑ Bennett PM, Gautel M (June 1996). "Titin domain patterns correlate with the axial disposition of myosin at the end of the thick filament". Journal of Molecular Biology. 259 (5): 896–903. doi:10.1006/jmbi.1996.0367. PMID 8683592. 1 2 Machado C, Sunkel CE, Andrew DJ (April 1998). "Human autoantibodies reveal titin as a chromosomal protein". The Journal of Cell Biology. 141 (2): 321–33. doi:10.1083/jcb.141.2.321. PMC 2148454 . PMID 9548712. ↑ Machado C, Andrew DJ (2000). "Titin as a chromosomal protein". Advances in Experimental Medicine and Biology. 481: 221–32; discussion 232–6. doi:10.1007/978-1-4615-4267-4_13. PMID 10987075. ↑ Siu BL, Niimura H, Osborne JA, Fatkin D, MacRae C, Solomon S, Benson DW, Seidman JG, Seidman CE (March 1999). "Familial dilated cardiomyopathy locus maps to chromosome 2q31". Circulation. 99 (8): 1022–6. doi:10.1161/01.cir.99.8.1022. PMID 10051295. ↑ Hackman P, Vihola A, Haravuori H, Marchand S, Sarparanta J, De Seze J, Labeit S, Witt C, Peltonen L, Richard I, Udd B (September 2002). "Tibial muscular dystrophy is a titinopathy caused by mutations in TTN, the gene encoding the giant skeletal-muscle protein titin". American Journal of Human Genetics. 71 (3): 492–500. doi:10.1086/342380. PMC 379188 . PMID 12145747. ↑ Udd B, Vihola A, Sarparanta J, Richard I, Hackman P (February 2005). "Titinopathies and extension of the M-line mutation phenotype beyond distal myopathy and LGMD2J". Neurology. 64 (4): 636–42. doi:10.1212/01.WNL.0000151853.50144.82. PMID 15728284. ↑ Hinson JT, Chopra A, Nafissi N, Polacheck WJ, Benson CC, Swist S, Gorham J, Yang L, Schafer S, Sheng CC, Haghighi A, Homsy J, Hubner N, Church G, Cook SA, Linke WA, Chen CS, Seidman JG, Seidman CE (August 2015). "HEART DISEASE. Titin mutations in iPS cells define sarcomere insufficiency as a cause of dilated cardiomyopathy". Science. 349 (6251): 982–6. doi:10.1126/science.aaa5458. PMID 26315439. ↑ Kontrogianni-Konstantopoulos A, Bloch RJ (February 2003). "The hydrophilic domain of small ankyrin-1 interacts with the two N-terminal immunoglobulin domains of titin". The Journal of Biological Chemistry. 278 (6): 3985–91. doi:10.1074/jbc.M209012200. PMID 12444090. 1 2 Miller MK, Bang ML, Witt CC, Labeit D, Trombitas C, Watanabe K, Granzier H, McElhinny AS, Gregorio CC, Labeit S (November 2003). "The muscle ankyrin repeat proteins: CARP, ankrd2/Arpp and DARP as a family of titin filament-based stress response molecules". Journal of Molecular Biology. 333 (5): 951–64. doi:10.1016/j.jmb.2003.09.012. PMID 14583192. ↑ Ono Y, Shimada H, Sorimachi H, Richard I, Saido TC, Beckmann JS, Ishiura S, Suzuki K (July 1998). "Functional defects of a muscle-specific calpain, p94, caused by mutations associated with limb-girdle muscular dystrophy type 2A". The Journal of Biological Chemistry. 273 (27): 17073–8. doi:10.1074/jbc.273.27.17073. PMID 9642272. ↑ Sorimachi H, Kinbara K, Kimura S, Takahashi M, Ishiura S, Sasagawa N, Sorimachi N, Shimada H, Tagawa K, Maruyama K (December 1995). "Muscle-specific calpain, p94, responsible for limb girdle muscular dystrophy type 2A, associates with connectin through IS2, a p94-specific sequence". The Journal of Biological Chemistry. 270 (52): 31158–62. doi:10.1074/jbc.270.52.31158. PMID 8537379. ↑ Lange S, Auerbach D, McLoughlin P, Perriard E, Schäfer BW, Perriard JC, Ehler E (December 2002). "Subcellular targeting of metabolic enzymes to titin in heart muscle may be mediated by DRAL/FHL-2". Journal of Cell Science. 115 (Pt 24): 4925–36. doi:10.1242/jcs.00181. PMID 12432079. ↑ Young P, Ehler E, Gautel M (July 2001). "Obscurin, a giant sarcomeric Rho guanine nucleotide exchange factor protein involved in sarcomere assembly". The Journal of Cell Biology. 154 (1): 123–36. doi:10.1083/jcb.200102110. PMC 2196875 . PMID 11448995. ↑ Gregorio CC, Trombitás K, Centner T, Kolmerer B, Stier G, Kunke K, Suzuki K, Obermayr F, Herrmann B, Granzier H, Sorimachi H, Labeit S (November 1998). "The NH2 terminus of titin spans the Z-disc: its interaction with a novel 19-kD ligand (T-cap) is required for sarcomeric integrity". The Journal of Cell Biology. 143 (4): 1013–27. doi:10.1083/jcb.143.4.1013. PMC 2132961 . PMID 9817758. ↑ Mayans O, van der Ven PF, Wilm M, Mues A, Young P, Fürst DO, Wilmanns M, Gautel M (October 1998). "Structural basis for activation of the titin kinase domain during myofibrillogenesis". Nature. 395 (6705): 863–9. doi:10.1038/27603. PMID 9804419. ↑ Zou P, Gautel M, Geerlof A, Wilmanns M, Koch MH, Svergun DI (January 2003). "Solution scattering suggests cross-linking function of telethonin in the complex with titin". The Journal of Biological Chemistry. 278 (4): 2636–44. doi:10.1074/jbc.M210217200. PMID 12446666. ↑ Mues A, van der Ven PF, Young P, Fürst DO, Gautel M (May 1998). "Two immunoglobulin-like domains of the Z-disc portion of titin interact in a conformation-dependent way with telethonin". FEBS Letters. 428 (1-2): 111–4. doi:10.1016/S0014-5793(98)00501-8. PMID 9645487. ↑ Centner T, Yano J, Kimura E, McElhinny AS, Pelin K, Witt CC, Bang ML, Trombitas K, Granzier H, Gregorio CC, Sorimachi H, Labeit S (March 2001). "Identification of muscle specific ring finger proteins as potential regulators of the titin kinase domain". Journal of Molecular Biology. 306 (4): 717–26. doi:10.1006/jmbi.2001.4448. PMID 11243782. ↑ McCulloch S. "Longest word in English". Sarah McCulloch.com. Archived from the original on 2010-01-14. Retrieved 2016-10-12. ↑ Oxford Word and Language Service team. "Ask the experts - What is the longest English word?". AskOxford.com / Oxford University Press. Archived from the original on 2008-09-13. Retrieved 2008-01-13. Tskhovrebova L, Trinick J (September 2003). "Titin: properties and family relationships". Nature Reviews. Molecular Cell Biology. 4 (9): 679–89. doi:10.1038/nrm1198. PMID 14506471. Kinbara K, Sorimachi H, Ishiura S, Suzuki K (August 1998). "Skeletal muscle-specific calpain, p49: structure and physiological function". Biochemical Pharmacology. 56 (4): 415–20. doi:10.1016/S0006-2952(98)00095-1. PMID 9763216. Kolmerer B, Witt CC, Freiburg A, Millevoi S, Stier G, Sorimachi H, Pelin K, Carrier L, Schwartz K, Labeit D, Gregorio CC, Linke WA, Labeit S (1999). "The titin cDNA sequence and partial genomic sequences: insights into the molecular genetics, cell biology and physiology of the titin filament system". Reviews of Physiology, Biochemistry and Pharmacology. 138: 19–55. doi:10.1007/BF02346659. PMID 10396137. Trinick J, Tskhovrebova L (October 1999). "Titin: a molecular control freak". Trends in Cell Biology. 9 (10): 377–80. doi:10.1016/S0962-8924(99)01641-4. PMID 10481174. Sorimachi H, Ono Y, Suzuki K (2000). "Skeletal muscle-specific calpain, p94, and connectin/titin: their physiological functions and relationship to limb-girdle muscular dystrophy type 2A". Advances in Experimental Medicine and Biology. 481: 383–95; discussion 395–7. doi:10.1007/978-1-4615-4267-4_23. PMID 10987085. Tskhovrebova L, Trinick J (February 2002). "Role of titin in vertebrate striated muscle". Philosophical Transactions of the Royal Society of London. Series B, Biological Sciences. 357 (1418): 199–206. doi:10.1098/rstb.2001.1028. PMC 1692937 . PMID 11911777. Sela BA (July 2002). "[Titin: some aspects of the largest protein in the body]". Harefuah. 141 (7): 631–5, 665. PMID 12187564. Tskhovrebova L, Trinick J (November 2004). "Properties of titin immunoglobulin and fibronectin-3 domains". The Journal of Biological Chemistry. 279 (45): 46351–4. doi:10.1074/jbc.R400023200. PMID 15322090. Wu Y, Labeit S, Lewinter MM, Granzier H (December 2002). "Titin: an endosarcomeric protein that modulates myocardial stiffness in DCM". Journal of Cardiac Failure. 8 (6 Suppl): S276–86. doi:10.1054/jcaf.2002.129278. PMID 12555133. Look up the full chemical name of titin in Wiktionary, the free dictionary.